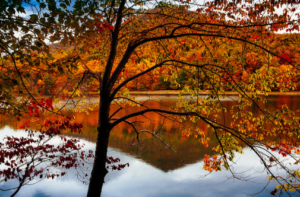 Fall Foliage & Leaf Peeping Science, first, let us have a quick lesson on how and why leaves change color. Once the leaves fully develop on the trees, they start making and storing the carbohydrates that are required for the new tree growth in the following year. Therefore, weather conditions in 2017 were the major factor to predict when the leaves will peak in their color in 2018. As the season progresses, in late summer or early fall, the trees enter a growth process that produces the colorful fall leaves, according to U.S. NATIONAL ARBORETUM. Chlorophyll gives the leaves their green color. Once the nights get longer in the early fall, the cells reach a point near the juncture of the leaf and stem divide rapidly but do not expand. This action of the cells form a layer called the abscission layer. The abscission layer blocks the transportation of materials from the leaf to the branch and from the roots to the leaves. Once the chlorophyll is blocked from the leaves, it disappears completely from the leaves and the color changes begin. Lacking chlorophyll allows the yellow and orange pigments to be visible. The red and purple pigments are manufactured from the sugars that are trapped in the leaf. These pigments in leaves are responsible for the vivid color changes in the fall. Temperature, sunlight and soil moisture all play a role in how the leaves will look in the fall. Abundant sunlight and low temperatures after the abscission layer forms because the chlorophyll is destroyed more rapidly. Cool air (especially at night) with a lot of daytime sunshine promotes the formation of more red and purple pigments. Freezing conditions destroy the leaf’s ability to manufacture the red and purple pigments. Early frost will end the colorful foliage. Drought during the growing season can cause the abscission layer to form early and cause the leaves to drop before they change color. The best weather for brilliant fall foliage is a growing season with ample moisture followed by a dry, cool and sunny autumn with warm days and cool but frostless nights. Heavy wind or rain can cause the leaves to fall before they fully develop color. Located between Lexington and Staunton Virginia Fox Hill B&B is a perfect home base for a variety of terrific fun activities for visitors. As fall comes, one attraction tends to take the cake – Fall Foliage & Leaf Peeping in Shenandoah Valley. Miss the peak by even one or two weeks, and you will be disappointed. Now is the time to make your reservation, before there are no rooms at the inn. September 15th typically begins the start of cooler evenings, which triggers the trees to once again to put on their show of brightly colored leaves. Many weather factors determine how intense the colors will be and how long the vivid leaves will be hanging around before they fall. While enjoying your stay at Fox Hill Bed and Breakfast, whether a weekend or a week, there are numerous places to explore. Bring your camera to capture some of the most memorable fall foliage & leaf peeping moments of your visit. A hike along any of the trails in the area will provide breathtaking views and lasting memories, and you will be able to see many vistas not accessible by car. We are close to Crabtree Falls and Natural Bridge state park. Download our free activity guide for a list of hiking and biking trails. 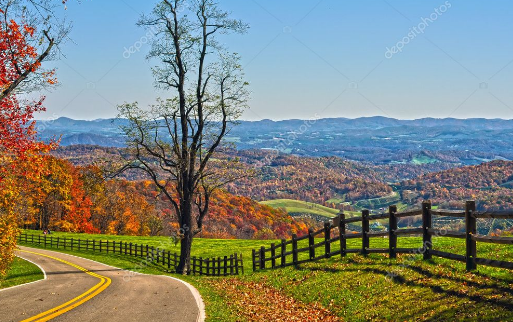 There are a few driving routes that will take you up close and personal with the many fantastic colors, too. Drive the Blue Ridge Parkway from Massies Mill, at mile marker 27.2 off VA Route. 56 just about 20 minutes from Fox Hill. We suggest that you travel south to the next exit outside of Lexington to mile-marker 45.6. 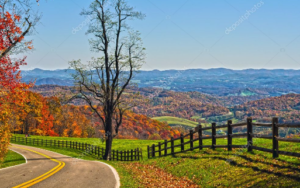 Along the route, you will encounter many “scenic overlooks”. The return driving route is Route 11 North passing through Lexington. Our free activity guide identifies many places for a bite to eat. A few other routes travel through Bath County or south toward Botetourt County. No matter where you travel in the Valley, the Fall season provides breathtaking, colorful displays put on by the trees. If you simply want to slow down, enjoy a glass of wine, and take in the colors of mountains, you can do that right on our enclosed front porch. There is no need to worry about drinking and driving, as you will be comfortably at your destination! To top it off, if you did not bring along or purchase a bottle of wine from a local vineyard, we have Virginia wines from the Peaks of Otter vineyards for your enjoyment. Plan your visit now. Come see, as one guest described the fall colors – the mountains are on fire!